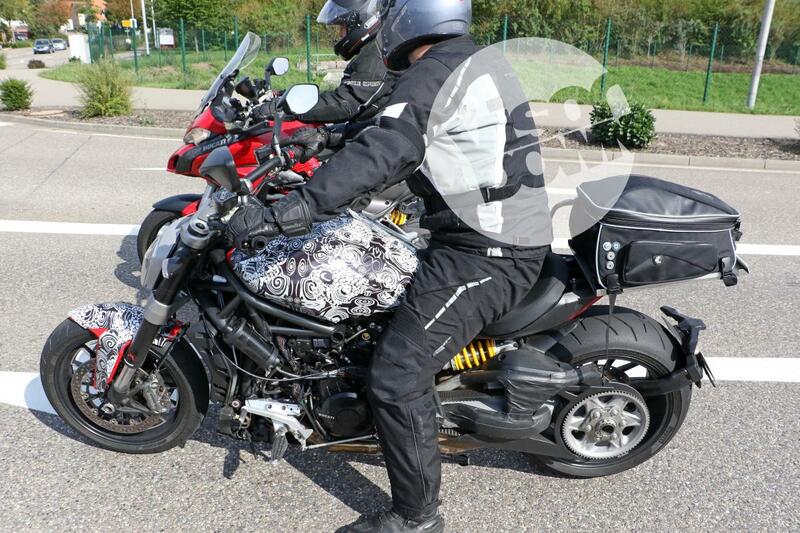 HERE'S a fresh look at the new belt-driven Diavel, which was spotted during testing in Germany. This new spy shot of the 2016 Ducati Diavel gives us a crisper look at the bike we brought you images of in August. The most major changes are the switch to a belt drive, accompanied by a new swingarm, which is covered in what looks like gaffa tape. The horizontal rear shock has been re-homed, moving from its low-slung position under the exhaust to under the seat. Like the current Diavel, this bike is using Marzocchi forks, although Marzocchi’s parent company, Tenneco, intends to discontinue the brand by the end of 2015. Ohlins already makes forks for the Diavel, so we wouldn’t be surprised to see the 2016 Diavel equipped with Ohlins forks from the showroom. The tank looks like it’s been reshaped to be slimmer and shorter than the one on the current bike and the pegs have been shifted forwards for a feet-first riding position. We still haven’t seen the new bike with a belly pan or bikini fairing, and it looks like the new Diavel could come without the side air intakes of the current model.